This is a group of songs about one lady… her name is not important… she knows who she was…What is important is once she loved me very much…These songs are a truthful attempt to show the effect the loss of this love had on me… They are not all sad songs full of self pity and remorse… but more a mixture of good and hard time, old and new thought, lost and found feeling, and near and far places… There was no pleasure (as there usually is) in writing this album… there was only the dull “thud” of realization that something you once took for granted is gone… and those “blue eyes” will never again look through this “old grey curtain”…The lady is dead now and I’m still alive… doing the same things with others I once did with her… and maybe that’s what being alive is all about it… if it isn’t… “to hell with it”. “He was a storyteller, that’s his music… the storytelling. That’s the thing I fell in love with him for. This final story that we see, the Requiem story, is kind of looking back at a career, I think. Not just a relationship—it’s his story. I think it’s authentic and the most revealing, really, because other things are cloaked, cloaked in romanticism, in a way. When you think of ‘Sand’ and ‘Jose,’ ‘My Autumn’s Done Come’ and ‘Some Velvet Morning’… those are stories, they’re stories you make up… they’re fiction. This is a little closer to home, I think.” -Suzi Jane Hokom. 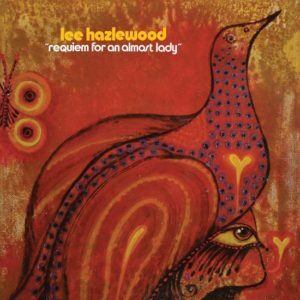 Light in the Attic Records is proud to continue its Lee Hazlewood Archival Series with LHI Records final release. 1971’s Requiem for An Almost Lady is a personal statement and one of the heaviest break-up albums of all time. There are no lilting strings, sweeping choirs, or dancing trumpets. The arrangements are stripped down to the raw nerve; Lee’s emotions are the orchestra here. The listener eavesdrops on a sonic journal of heartbreak. After losing his lady, his record label, and his country, Lee etches his woes to wax.